Carrie Shaw was 19 when she began taking care of her mother, whose slow decline into Alzheimer’s dementia lasted nearly a decade. As her mother lost the ability to communicate, Shaw struggled with questions common to families and professional caregivers alike. Was she helping her mom? What more—or less—should she do to ease her mother’s fear, confusion, and pain? Ten years later, Shaw and the company she co-founded, Embodied Labs, are wrapping up their final reviews of the Alzheimer’s Project, a virtual reality immersion program that gives caregivers an experience of what it’s like to be in the grips of dementia. Shaw and two colleagues—short film and video director Ryan Lebar, and programmer and self-described transhumanist Tom Leahy—founded Embodied Labs to create virtual reality experiences for medical caregivers, ranging from emergency-room doctors to family members caring for a loved one. 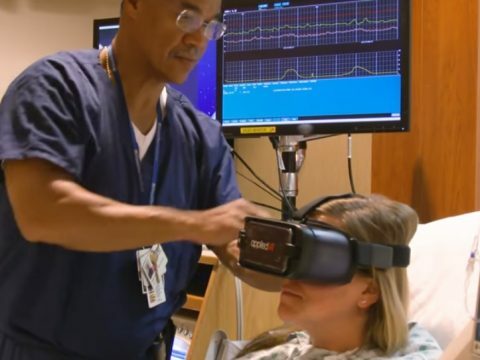 Since the company’s inception in 2016, Shaw and her team have focused on educating these providers using a technique called empathy VR, which immerses users in the world their patients experience and are often unable to communicate. Seeing through patients’ eyes not only creates empathy, Shaw says, but also reduces caregiver stress by providing insight on what’s beneficial for them and what’s not. According to the National Caregiver Alliance, more than 40 million Americans were unpaid caregivers in 2015. About a third cared for someone with dementia, with Alzheimer’s being the most common type. And while paid caregivers—ranging from certified nursing assistants to home health aides—number in the millions, they are far outnumbered by their unpaid counterparts. The strain of caregiving, particularly between families and friends, is often overlooked or oversimplified as simple acts of love and family bonding. In fact, caregiving of all types has a well-documented impact on the person providing the care, according to Roberto Velasquez, the executive director of the Southern Caregiver Resource Center. Programs like Embodied Labs’ are part of the emerging trend of using virtual reality to sample someone else’s experience and ease this stress. Although VR has been around since the early 1990s, it’s only in the last four or five years the equipment has become more affordable and less cumbersome. Dr. Mark Wiederhold, an internist who runs the Virtual Reality Medical Center in San Diego with his wife, Brenda Wiederhold, a Ph.D psychologist, still remembers the groundbreaking simulation that gave hospital staff, doctors and police a window into schizophrenia. With it, for the first time, emergency responders and caregivers could hear the voices that made it difficult to communicate with episodic schizophrenics in the field. In more recent years, the Wiederholds’ clinic has won contracts with the military and the Veterans Administration to develop and use virtual reality for post-traumatic stress disorder among veterans returning from war. The vets often go home to their families before they have their first, often terrifying, experience of the disorder. In the Wiederholds’ clinic, once family members—who are primary caregivers—are exposed to their loved one’s pain, the care they provide becomes informed by a firsthand experience. In addition to providing more suitable care for their family, this helps alleviate feelings of helplessness for a provider. Beyond individual families, the Wiederholds have spent the last three years working closely with a European government agency they declined to name, studying how to alleviate job burnout in teachers, physicians, and nurses—professional caregivers. The most effective approach they’ve found uses virtual reality to manage stress symptoms before they accumulate into a meltdown. Whether caregivers are struggling with their loved ones’ PTSD or dementia, they are often overwhelmed by what they don’t understand and not knowing if what they are doing to help actually helps. That’s one of the most important outcomes Shaw wants to see with Embodied Labs’ current project. Shaw and her team are near the end of an Alzheimer’s Project test run at a residential-care facility in Chicago. Initial feedback from the staff there has been positive. To gain insight into the patient experience so it would be accurately and vividly reproduced in the VR experience, Shaw and her team partnered with the University of Illinois’ College of Medicine. Together, Embodied Labs and the university researchers are working to advance geriatric research. Their first joint project, We Are Alfred, simulates the experience of a 74-year-old with hearing loss and fading vision due to macular degeneration. 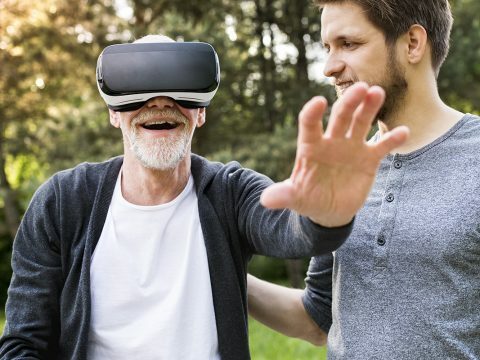 The company found that medical students were far more empathetic and far less likely to show bias against aging patients after they experienced the Alfred VR experience. “Visual communication can break through language barriers, cultural barriers and educational barriers,” Shaw said. As a result of their collaboration, Alfred is now part of healthcare provider education at the medical school, and the medical school is also using it to help patients’ families. The Alzheimer’s Project is slated to drop in late September or early October of this year. Caregivers at the Chicago facility report that they feel better about the treatment they provide, which reduces their stress and makes them more effective at their jobs.